FILE - Nigeria's President Muhammadu Buhari meets with some of the newly released Dapchi schoolgirls in Abuja, Nigeria, March 23, 2018. A Nigerian news company released an alleged "proof of life" audio recording Monday night of Leah Sharibu, one of the so-called Dapchi Girls abducted in February by Boko Haram militants. Sharibu is among more than 100 female students taken hostage by the Islamists in the northeastern Nigerian town of Dapchi. Insurgents released other classmates but continue to hold Sharibu captive, reportedly because she refused to convert from Christianity to Islam. In the recording, a female voice says, "I am Leah Sharibu. 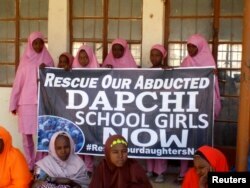 I was kidnapped from Dapchi school and I am begging the Nigerian government to have pity on me." The audio and a photo of Sharibu in captivity were aired Monday night by Nigerian online news outlet The Cable. Leah's father, Nathaniel Sharibu, says the voice is his daughter's. "It's her. She is the one," he said. "I feel very, very encouraged yesterday as I heard her voice. I believe now that my daughter is still alive." In the 35-second audio clip, the voice alleged to be Sharibu's asks the Nigerian government to help her family, as they have been having a hard time since her abduction. FILE - Schoolgirls wait for the arrival of Nigeria's President Muhammadu Buhari at the government girls' science and technical college in Dapchi, Nigeria, March 14, 2018. The Free Leah Sharibu hashtag and the audio recording have been trending on Nigeria's social media. Nigerian activist Rebecca Gadzama calls the audio recording an answered prayer. "I knew it would come up one day. I had the confidence in me that the government wants to bring this girl back, so all along I have been positive," Gadzama said. The Nigerian government did not immediately confirm the audio's authenticity. A spokesman for President Muhammadu Buhari said they were investigating the recording. The Bring Back Our Girls movement, which launched after Boko Haram's 2014 abduction of the Chibok school girls, vowed to increase pressure on the government to free Sharibu. "Why I would have wanted to [see a] video is so that we can see her condition," said Allen Manasseh, a member of the movement. "I want to see [a] video and clear terms of her rescue. What do they want to release her? They should tell us exactly what they want in exchange for Leah. Is it money? Is it their fighters that were arrested in the past or what exactly do they want? If the government is serious, it could release these girls in 24 hours." The Nigerian government was heavily criticized for the time it took to free many of the 276 school girls Boko Haram took from Chibok. Eighty-nine were released last year in a government swap for Boko Haram prisoners, but more than a hundred are still missing and believed to be in captivity. Rights groups say Boko Haram has abducted at least 2,000 children since 2009, when it began fighting for an Islamist state.